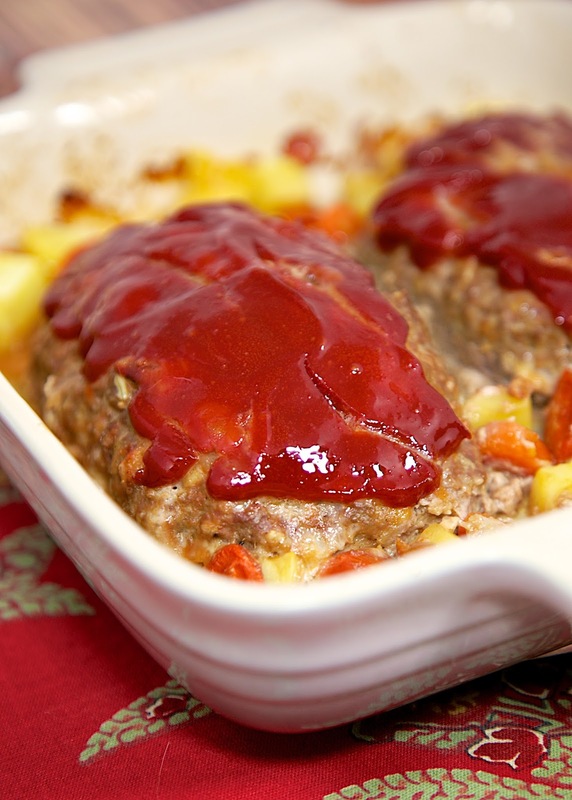 Mom's Meatloaf Recipe - comfort food at its best! This recipe makes 2 small loaves - serve one for dinner and serve the leftovers as sandwiches for lunch the next day. I've never been a fan of meatloaf, but my Mom sent me this recipe and swore it was good. All the ingredients sounded good, so I gave it a try. Mom was right, this was really good. This recipe makes two small loaves. We ate one for dinner and sliced the other one up for sandwiches the next day. We served the meatloaf with the Ranch Mashed Potatoes I shared last week. YUM! Comfort food at its best! I topped our meatloaf with ketchup, but BBQ sauce would be good too! If you are into freezer meals, you could make the meatloaf and freeze it uncooked. Just thaw it out before baking. Tear bread into pieces and soak in 1/2 cup milk. Combine bread with remaining ingredients (except ketchup). Shape into 2 loaves and place in 9x9-inch pan. 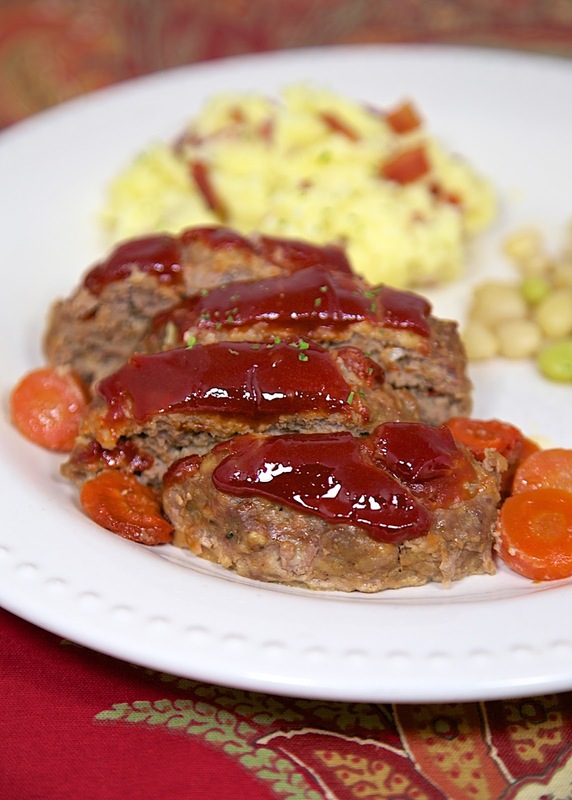 Top eat meatloaf with ketchup or BBQ sauce. This is pretty close to my mom's recipe except she doesn't put all the different flavored salts...she uses Lawry's seasoned salt to try to keep the sodium level lower. She also puts some brown sugar in it and she uses crackers instead of bread. I changed the recipe up a bit...instead of seasoned salt I use Morton's Natures Seasoning and I also use Italian bread crumbs instead of crackers or bread. Also, mom uses a cake pan to bake hers and I use a loaf pan. There is nothing like leftover meatloaf sandwiches topped with a slice of cheese...all warm and gooey...YUM!!! It has been a while since I made meatloaf....now I've got a hankering LOL. Kellie, I'm with you...now I want meatloaf!!! Do you cook your carrots and beans in the pan with the meatloaf?? It looks like there are carrots in the baking dish. I did chop up a potato and put come canned carrot slices in the pan with the meatloaf. Oh Stephanie...I made this on Saturday and ended up with meatloaf soup!! I soaked the bread in the 1/2 cup of milk and then further down in the recipe it says to add to remaining ingredients which lists another 2/3 cup of milk. Is that correct? I see you removed the 2/3 cup of milk from your list of ingredients. Thank you for confirming. Sounds like a fine recipe, especially with the sausage in it. I think the sausage gave it lots of extra flavor! It was really good.